Spruce up the look of your bathroom with this fine-crafted, efficient sink from Sinkology. Its tough copper design can withstand years of everyday use, maintaining a stylish appearance. Perfect for all kinds of bathroom styles, this sink is fantastic choice for your next home improvement project. This sink from Acri-Tec adds a nice touch of elegance to any bathroom. You'll be impressed at how well its stylish ceramic design holds up against everyday wear and tear. You'll be glad you chose this top-grade sink for your next home renovation project. The perfect combination of style and lasting durability, this sink from Fresca is just the upgrade your bathroom needs. Constructed out of sturdy material, it maintains a stylish appearance through all kinds of everyday wear and tear. Complete your next home improvement project by installing this top-of-the-line sink in your bathroom. Fine artistic craftsmanship for long-lasting, perfect for new bathroom decor. It is sophisticated design will add new look and value to your bathroom decor. The square-shaped bathroom sink is crafted from vitreous china that is baked at high temperatures so the surface is stain-resistant, germ-resistant and easy to clean. Stylish and extra durable by design, this vessel sink from Kraus is sure to be a staple of your bathroom remodel. You'll be impressed at how well its stylish glass design holds up against everyday wear and tear. Complete your next home improvement project by installing this top-of-the-line sink in your bathroom. Maxwell 18-inch x 6.50-inch x 14-inch Oval Copper Bathroom Sink Spruce up the look of your bathroom with this fine-crafted, efficient sink from Sinkology. Its tough copper design can withstand years of everyday use, maintaining a stylish appearance. Perfect for all kinds of bathroom styles, this sink is fantastic choice for your next home improvement project. 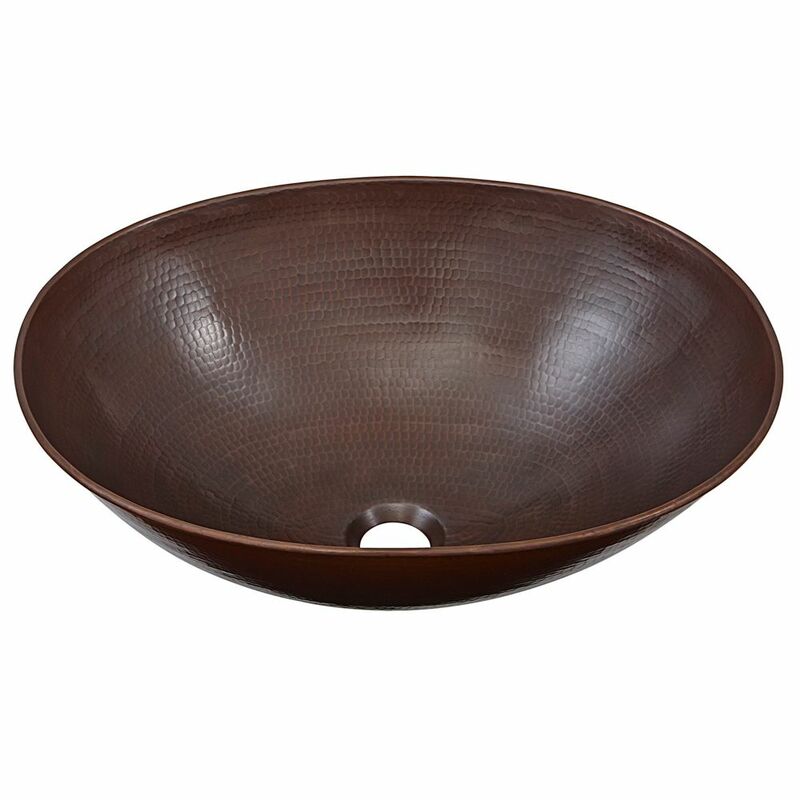 Maxwell 18-inch x 6.50-inch x 14-inch Oval Copper Bathroom Sink is rated 5.0 out of 5 by 2. Rated 5 out of 5 by Dee from Excited about this sink! We have just purchased this sink and have not installed it as yet, however I love it. Third one to buy as part of making the decision. First was to small, second was normal round and I didn't really want one that common. This is a nice size and oblong/oval. It will be perfect. You'll love it too if you want something a little different than the common round. Is the included drain grid or pop up? We apologize for the miscommunication, there is no drain included with this sink, we are working with Home Depot to correct the product listing.